The OD Shag Club Dance Team was asked to return to St James Elementary School in Socastee, SC for their Annual Arts Day April 12, 2019, at 7:30AM. It was a beautiful early morning on April 12, 2019, when the OD Shag Club Dance Team entered St James Elementary School for their Annual Fine Arts Day. We were warmly met by Kaleigh Vanlandingham Art Teacher and the Staff and then directed to the mobile class room to set up and began to demonstrate and instruct the Shag Dance to the 5 thru 9-year old’s. As usual the students were very well mannered and at the same time excited to learn the dance. Linda Campbell and Lori Setzer gave a short and simplified version of the history of the Shag Dance to the young students and their teachers. The Dance Team began this event at 8:00AM with each group of approximately 15-20 students and finished at 11:00AM. So, the Dance Team had about 140 students rotating every 30 minutes throughout the morning. This event that the Dance Team is invited to each year, the enthusiasm of the students, their participation and wanted to learn is without one of the most rewarding events that we attend. Thank you to Kayleigh Vanlandingham Art Teacher at St James for inviting the OD Shag Dance Team for us to promote the Shag Dance to such a fine young group of future shaggers. Also, thank you to all the teachers that participated and learned how to Shag. 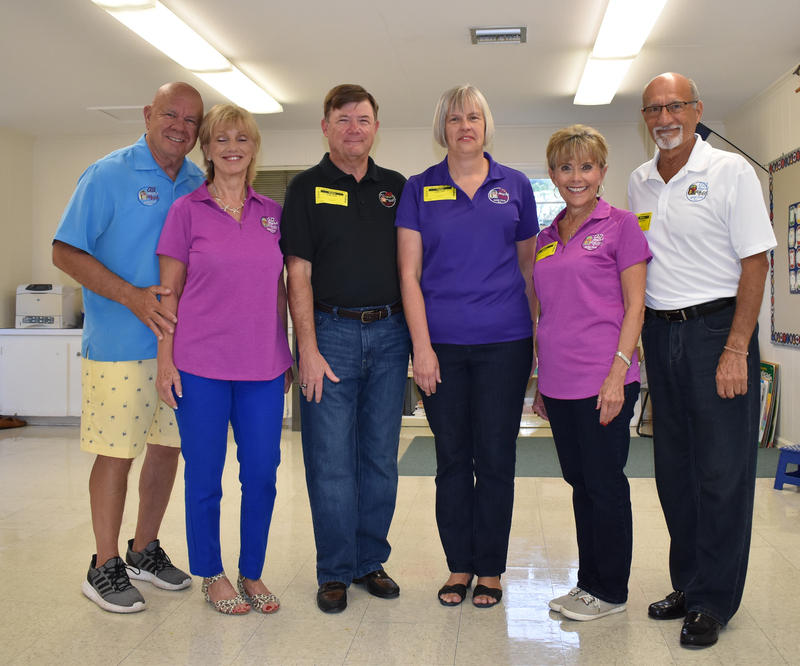 Many thanks to the early birds of the dance team: John and Lori Setzer, Bill and Diane Millman and Linda Campbell and Lou Martino for making this one of the most enjoyable events on our schedule. 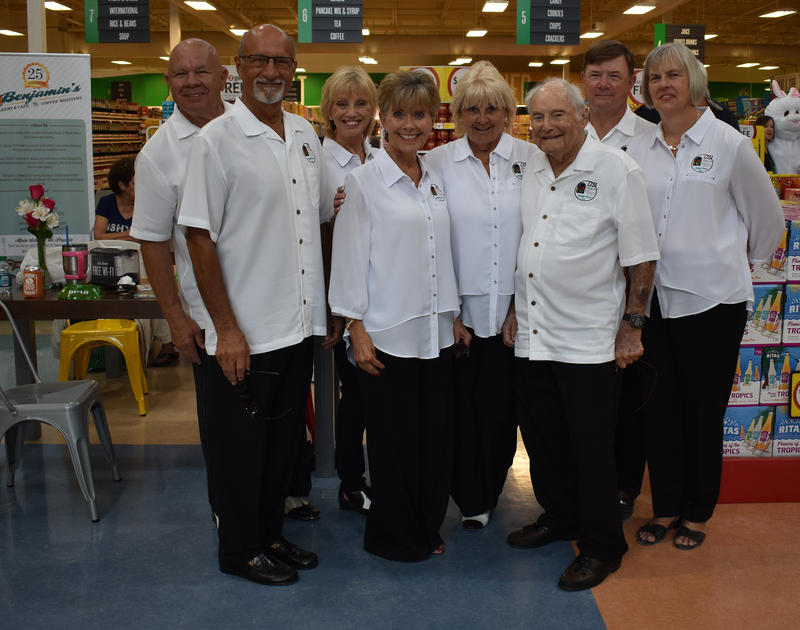 The OD Shag Club Dance Team had a great opportunity to share our beloved dance with the community when asked to dance at the Windy Hills (North Myrtle Beach) Bi-Lo on Wednesday, April 10th and again on Saturday, April 12th. Three Couples were requested by Ms. Alice Cox for each day to dance. On Wednesday, Lori and John Setzer, Bill and Diane Millman and Lou Martino and Linda Campbell entertained the customers and the Bi-Lo staff to the tunes spun by the DJ Jimmy. A great time was evident as many of the Bi Lo staff jumped in and took a quick lesson to learn to shag and then tried out their new steps and they even did a line dance or two. Saturday started out with a downpour of rain and an abundanceof customersforthe “Grand Re-­‐opening”. Lots of prizes, food and drink were given out and the music could be heard coming from the front of the store from the band Three Peace. Again, Lori and John Setzer, Bill and Diane Millman, Linda Campbell and Lou Martino were available to dance. We were also honored to have Lenny Gardner back with the team to dance a few dances and a wonderful“Cha-­‐Cha” with Barbara Hopper. 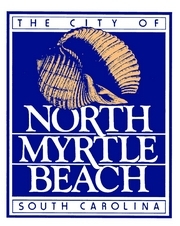 On October 22, 2018 the Dance Team was invited by Cathy Altman, Executive Director to demonstrate and instruct the Shag Dance at the North Myrtle Beach Area Historical Museum at 10:15AM on 2ndAve North. The group (approximately 20 in number) we danced for Winding River Historical Society from Bolivia, NC were so willing to learn the dance that they spent more time with the dance team than they were given to learn. They were very receptive and encouraging to participate. 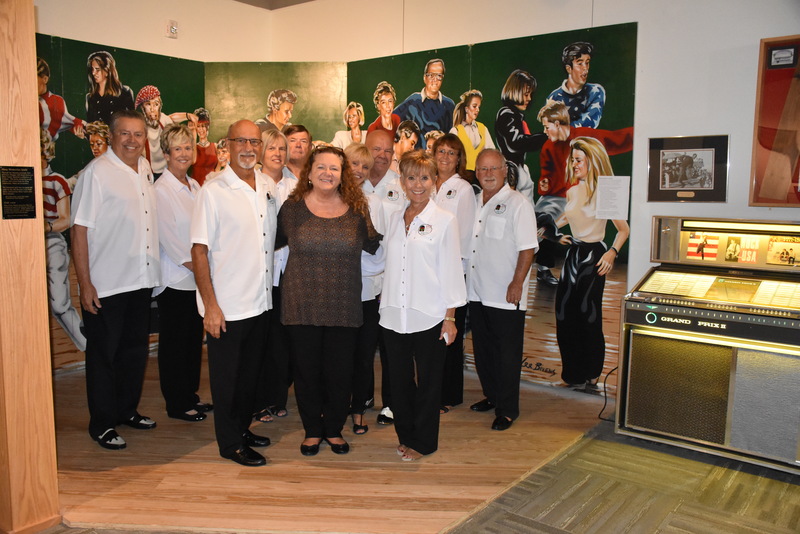 It was a great time and pleasure to be able to dance with the mural in the background of the legends of the Shag Dance at the Museum. After Linda Campbell our spokesperson gave the history and origin of the Shag Dance, she introduced the Dance Team Members. Each member danced their style for one and a half minutes. We also showed how to switch partners so the spectators could see that you don’t need a partner to be able to dance if they did not have a regular partner. They were all invited to come to Fat Harold’s when they were in the area. I would like to thank the dance team members who took their time to participate in this event: Back row: Rich and Cathy Jamiolkowski, Lori and John Setzer, Diane and Bill Millman, Callie White and Ted Sobol. Front row: Lou Martino, Cathy Altman and Linda Campbell.